"Of the thousands of foreign Christian missionaries who have served in Taiwan since World War II, few can have been better prepared for the island's society, language and environment than Dr David Landsborough IV." 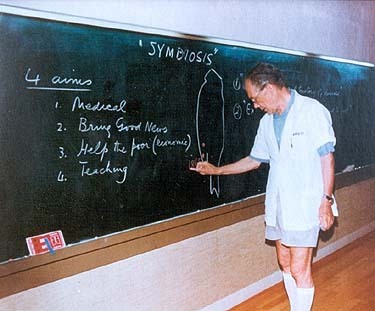 Dr David Landsborough IV was born in Changhua in central Taiwan in 1914, and spent much of his infancy and adolescence on the island, which was then a Japanese colony. He and his sister, initially the only western children in the region, grew up speaking both Taiwanese (a local language sometimes known as Minnan-hua or Hokkien) and English. In a 2002 interview at his home in England, Dr Landsborough said: "I've had a really interesting life. My friendships with people in Taiwan and Chuanchow (Quanzhou) [the town in mainland China where he worked from 1940 to 1951] have been so valuable. They've been very kind to me." "We made friends with Taiwanese children, playing games with them, wrestling, fishing, and visiting them in their homes," recalls the retired neurologist (shown aged 11 years at Changhua on left, courtesy Changhua Christian Hospital). 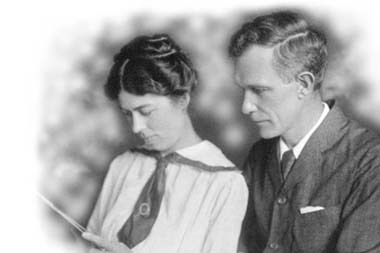 Landsborough's father -- Scottish-born medical missionary Dr. David Landsborough III (shown right with his wife, courtesy Tzu Chi Foundation) -- arrived in Changhua in 1896. There, in connection with the Presbyterian Church, he established a small hospital. Changhua Christian Hospital now has more than 1,000 beds. During the 1920s and 1930s the elder Landsborough and his English-born wife, Marjorie, employed a maid and a cook. Despite the absence of electricity and running water, the family lived comfortably in a spacious two-story redbrick house. It was in this house that David Landsborough IV was born (his sister was born in England), and it was here that he lived after he returned to Taiwan in 1952. Despite growing up in Taiwan, the Landsborough children were raised on British-style food. There was one significant difference, however. "Irish potatoes were almost unknown," says Landsborough. Like their Taiwanese neighbors, the missionary family ate rice or sweet potatoes several times a week. The household baked its own bread, however, and enjoyed imported condensed milk and butter. Changhua is now an important industrial center with more than 220,000 residents. In the 1920s, by contrast, it was a quiet market town. The only factories Landsborough remembers were pineapple canneries and a fireworks plant. Traveling with his mother and sister -- his father would usually remain at the hospital and attend to patients -- the boy saw much of Taiwan. 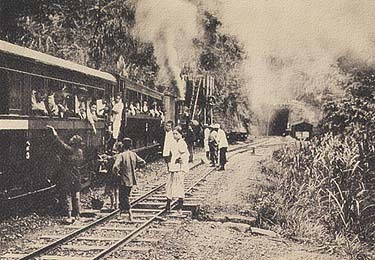 He has fond memories of taking the logging train (shown left in the 1920s) to the mountain resort of Alishan, and visiting Sun Moon Lake, which at that time was not accessible by motor vehicle. 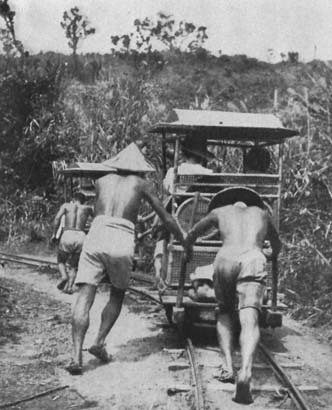 To get there from Changhua, the Landsboroughs would take first a conventional train, then ride a narrow-gauge railway, then transfer to Taiwan's now-defunct system of human-powered "push-car" rail trolleys. Each trolley seated two or three passengers plus their baggage. An attendant, who controlled the speed using a simple brake mechanism, pushed from behind, his efforts aided or hindered by gravity; there was no other propulsion. "On steep sections the passengers would get out and help push. But on downhill runs it would be like riding a toboggan!" 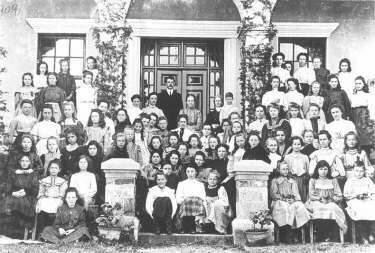 Landsborough recalls. The rail-trolley network did not quite reach the lake. Passengers got off about an hour's walk away, and completed the journey on foot. To escape Taiwan's scorching summers, the Landsboroughs spent much of each July and August several hundred meters above sea level in a stone cottage near the peak of Tatunshan, a mountain not far from Peitou, a popular hot springs resort in north Taiwan. "It was cooler and the view from the mountain was breathtakingly beautiful." says Landsborough. Initially educated at home by his mother, David Landsborough IV went on to attend a British high school in Yentai, in the northern part of mainland China. He would return to Taiwan each December. 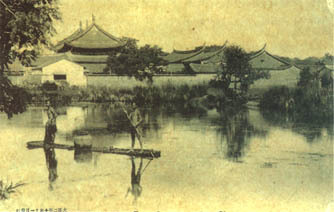 (The photograph at the right shows the Chefoo [Yentai] British High School in 1908). "Coming from the cold winters of North China we reveled in the warmth and sunshine of Taiwan, the food, the plentiful fruit, the games of tennis and the opportunity of seeing our friends," Landsborough added. He then followed in his father's footsteps, journeying to London in 1931 to study medicine. 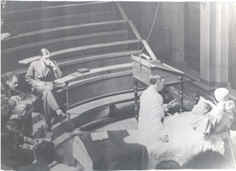 In 1940 Dr. David Landsborough IV returned to the Far East, bound this time for mainland China. He began working as a medical missionary in Chuanchow, a Hokkien-speaking part of Fujian province. Many of Taiwan's people have ancestral links with that part of the mainland, and Landsborough comments, "Having seen where the Taiwanese came from, I can understand them better." Conditions in Chuanchow were harsh. Tuberculosis, malaria and typhoid fever were widespread. The hospital handled dozens of cases of bubonic plague. And although the area was never occupied by the Imperial Japanese Army, whose forward positions were less than 100 kilometers away, Japanese aircraft sometimes bombed the city. They served together on the Chinese mainland until January 1951, when political conditions made staying on impossible. "If it hadn't been for the Communist takeover, it's likely we would have continued in Chuanchow," says Landsborough. After a brief period in England, during which the couple adopted twin baby boys, Dr. David Landsborough IV accepted an invitation to join the staff of Changhua Christian Hospital. In 1955 he was appointed superintendent. "I had mixed feelings," admits Landsborough. "My father had a tremendous reputation... but I certainly felt a tremendous welcome." His father's legendary patience was an inspiration. "I never saw him angry, even at home." While on furlough in the UK in 1957, the couple adopted a baby girl. The younger Landsboroughs sometimes took their children to Taiwan's southern tip, to the scenic coastline that now forms part of Kenting National Park. "We very much liked the far south. The beaches were very natural, very untouched," he says, lamenting the commercialization of the area in recent years. 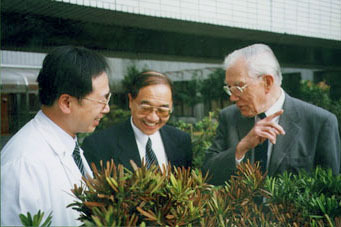 Accompanied by some of the hospital's staff, the doctor and his wife scaled Yushan (see left), Taiwan's highest mountain, and Snow Mountain, the island's second-highest peak. Unlike his father, who suffered frequent attacks of malaria and dysentery, the younger Landsborough was able to preserve his health. "I never got malaria simply because I was very careful to always use a mosquito net." 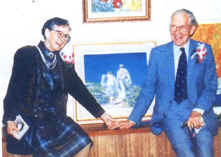 David and Jean worked at Changhua Christian Hospital for 28 years, before leaving Taiwan in 1980 for retirement in England. The Landsboroughs retired to Coulsdon, on the southern outskirts of London – not far from where his father lived between retiring from Taiwan in 1936 and his death in 1957. Despite his advanced age and the death of his wife in 1993, Dr. David Landsborough IV continues to travel widely. 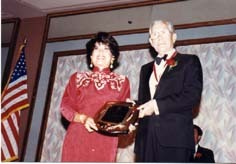 In 1991 he flew to California to accept the Taiwanese-American Society's Award for Social Service (presentation shown on left). At the presentation ceremony he described himself as "a Taiwanese person from Britain, who grew up in Changhua." 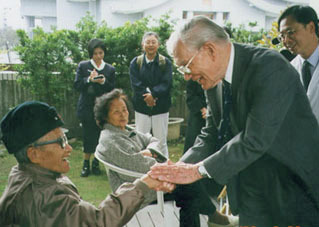 In 1996 Landsborough returned to the ROC to receive the Order of the Brilliant Star with Violet Grand Cordon (shown on right), presented to him by then President Lee Teng-hui. He points out that the award was primarily for the work his father did, and only secondarily was it for the family. On his most recent trip to Taiwan, in 1999, he visited Master Cheng Yen, founder of the Buddhist Compassion Tzu Chi Relief Association, and toured a large hospital that organization operates in Hualien, eastern Taiwan. He has returned to Chuanchow three times since 1986. Landsborough's strong attachment to Taiwan is obvious from the mementoes -- calligraphy scrolls, photographs and knickknacks -- which bedeck his house, and also from his visitors' book. In recent years dozens of doctors, pastors, diplomats and students from the ROC have called on this man, whose identification with the island and its people stems not only from his religious principles and medical career, but also from shared childhood experiences.